With the next expansion Mansions of Madness is leaving mansions behind completely and going full Planes, Trains and Automobiles. The first scenario preview for Horrific Journeys puts you on the 10:50 to Arkham. There are strange things happening on the train, and suddenly one of your friends disappears. Just to start with, I can see a huge advantage to a scenario on a train: You’ll finally know which how to orient the game board to have it fit the table as it grows. The preview also introduces a new mechanism in Mansions of Madness: Rifts. When those weak spots in the fabric of reality pop up you’ll want to close them. If you fail, however, you’ll be sucked straight into another world. Oops. Discover: Lands Unknown, one of Fantasy Flight’s two Unique Games, is for the most part a vaguely cooperative game. You don’t have to work together, but it certainly increases your chances to survive. Not so in the fifth scenario packed in every box. The fifth scenario will still be different from box to box, but all of them have one thing in common: Only one player can survive. But don’t expect an action packed Battle Royale, the rules are such that careful, well-planned attacks are the way to victory. The nuclear wastelands of Fallout are not a place to look for friendship and cooperation. It’s everyone for themselves out there. Unless, that is, you play the one cooperative scenario that comes with the New California expansion. Then you team up with the other players to help the little village of Arroyo. The village has been hit by a terrible drought, and you might just be able to find the device that can end it. But in the wastelands there’s always someone trying to cross your plans. In this case, your opponent is the Enclave, operating from their base on an old oil rig. They want to spread their influence into California, and Arroyo is in their way. Asmadi Games’s latest Kickstarter, the space route building game The Phoenix Syndicate, looks to be Asmadi’s biggest game to date. The players have big plans. They want to establish their own galactic trade syndicate on a modular game board of 27 hexes. Their goal is easy in theory: Claim trade route cards and then score them by having agents in all three systems on the card. But that description doesn’t do The Phoenix Syndicate justice, because there is so much going on around that simple core. You have to build efficient routes when all gates cost a different combinations of resources. You have to upgrade the actions on your player board. You have to earn extra money from being there when your opponents complete trade routes, infiltrate the five galactic guilds with your agents, and more. Becoming a Tidal Blade, one of the elite guards around whom Tidal Blades: Heroes of the Reef revolves, is not an easy task. You’ll have to travel between the islands and complete three challenges, each harder than the last. Fortunately, you’ll grow with your challenges. Passing challenges will let you upgrade your characters stats and unlock your character’s special abilities. You’ll also exchange your novice dice against better ones, but changing your dice means specializing. Why is it so hard to become a Tidal Blade, anyway? Well, they are the defenders against monsters, and fighting them will be part of the game. Tidal Blades: Heroes of the Reef is a very good-looking worker placement and dice management game, and the dash of adventure game character development rounds it off nicely. Cerberus, a new release by La Boite de Jeu, will be one of those games that makes people angry. Three to seven players have haplessly wandered into the Underworld. They obviously would like to escape, and working together is the best way to do that. Right until you find out that the barque to take you back across the River Styx doesn’t have enough seats, and no one wants to be left behind. It gets worse, though. You only find out how many seats the barque has when the first player arrives. The game is driven by cards that are always played with a choice: Do yourself a big favor, or help the whole group for now, because more surviving players give everyone a better chance not to be eaten by Cerberus. Oh, and if the three-headed puppy does get you, don’t worry. You’re not out of the game. You can still make sure that no one wins. Barrage, Cranio Creations’s hydroelectric alternate history game, is now on Kickstarter. In the early 1900s Europe is running out of resources, Nicola Tesla has created very efficient electric generators, and a number of mysterious explosions have created huge craters in the Alps. Put those three things together and there is profit to be made. Make sure that your company controls the flow of water with rivers, tunnels and dams. Bring it to your generators and supply energy to the world. You control your company with a simple yet clever action selection mechanism where your actions and resources stay locked in your player wheel until it spins around to them again. It’s supposed to do that every six rounds, but as a supplier of energy you might find ways to speed it up. 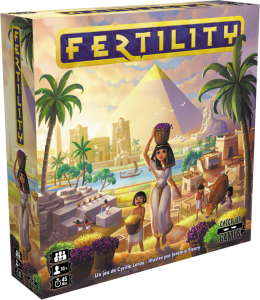 New from Catch Up Games this year is Fertility, a resource management in ancient Egypt. The players each are nomarch of an Egyptian metropolis. After the yearly flooding in the Nile valley they harvest resources from there to expand their city. With every resource harvested comes a tough choice: Build a new show in your Metropolis, or use everything to restock the shops you have and make money? Either way, resources you can’t use on your turn are lost. Placing tiles in the Nile valley looks similar to Sapiens, also by Cyrille Leroy and Catch Up Games. That’s a good thing since we enjoyed Sapiens a lot, and everything about Fertility besides this core mechanism is so different that it’s doubtlessly its own game, not a mere remake. Petrichor. The smell you get after rain. Also the title of a slightly odd but very good and beautiful game in which you play a cloud. All you want is to be the most valuable cloud, a title you earn by contributing the most to the Harvest. That’s a lot of responsibility for a small cloud like you, and so the expansion kickstarting at the moment will bring you help in the form of a bee. With the Honeybee expansion you get a bee standee – I’m disappointed that it’s not a beeple – to zip around the board and grant access to new actions where it stands. You also get honey as a new way to score points. The perfect expansion for the peaceful Petrichor. In the distant future of Dreams of Tomorrow it was discovered that the only way to save the present is to send dreams to the past, carrying inspiration that will make people change. You are a dream engineer, one of the people violating causality for fun and profit. In a game of Dreams of Tomorrow you assemble a set of five dream cards, and the better they go together, the more inspiring your dream is, the more points you score. Building a set of five cards is not so exciting, but how you get there is promising. You select actions by moving around on an action board. This board itself is modifiable. The dream fragments you work with come with special abilities, including ways to move actions around the board and bringing the action you really want in easy reach. Or maybe out of reach of an opponent. And if the dream card then doesn’t really fit in your dream … well, you had to make a decision, right? 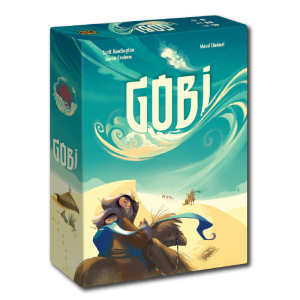 Gobi is another one of those simple games that nevertheless are full of interesting decisions. A storm has split up the nomadic tribes of the Gobi dessert. As a caravan driver you do your best to reunite them. Very easy in theory, all you need are two tiles showing the same tribe name and a line of cameeples – camel meeples, in case you’re new around here – connecting them. Not so easy in practice, because you only place camels on the tiles surrounding the new tile you place, not that tile itself. So you’ll have to place another tile to get a camel on that tile. If you want to score often you’ll have to be smart about your tile placement so you get the right camels. You have the strategic option to take negative points to place a camel wherever you like, and the rewards you get for reuniting tribes bestow special abilities. GMT Games are coming back to one of our favorite heavy games ever: Dominant Species. Even better, the new product is not an expansion. 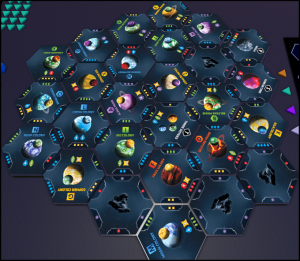 Dominant Species: Marine is a stand-alone game for up to four players. It has many similarities to the original Dominant Species, but some significant changes as well. The most interesting change seems to be that you no longer seek dominance over spaces on the board but over elements, which roughly translates to food sources. Dominance over an element is rewarded with a special action pawn with more power and flexibility than a regular one. Dominant Species: Marine also has the slogan “Like Dominant Species, only wetter”, and a good pun is always a point in favor. Here are two more heroes from Plaid Hat’s Guardians. The first new hero, Ronin, is only really happy when he’s in the middle of things. Every enemy hero at his location gives him an attack bonus, and his abilities are on the aggressive side as well. Whiplash’s shtick is movement. Her Zipline lets her herself move quickly, but with her abilities she can also move allies and enemies around. Like getting enemies to Ronin’s location, maybe? Geisha are a fascinating and confusing part of Japanese culture. Women that you pay to be with for their conversational skills, or their talents in the arts, or even for their ability to play games. They are personal entertainers, but with a long history and, to us, strange customes. Mai-Star, a game about geisha, will probably not do a thing to make you understand them better. But it will entertain you for half an hour, and then maybe for some more.